Okay, so it was a little more planned than that. For example, I knew that the story would begin in early May and that I wanted to start my journey the same week so that I could experience the landscape as Owen, my protagonist, does. I’d also marked on my map four locations that I knew I needed to hit for some key scenes and had booked a handful of cheap hotels (having no desire to sleep in fields and woods as Owen does). But – other than that – everything else was up for grabs; I’d see where the journey took me. The trip took over a fortnight and lead me out through the northern Czech Republic into Poland and across Germany to Leipzig, before heading north; and, like Owen, large sections of it were done on foot. Nothing en route was wasted. 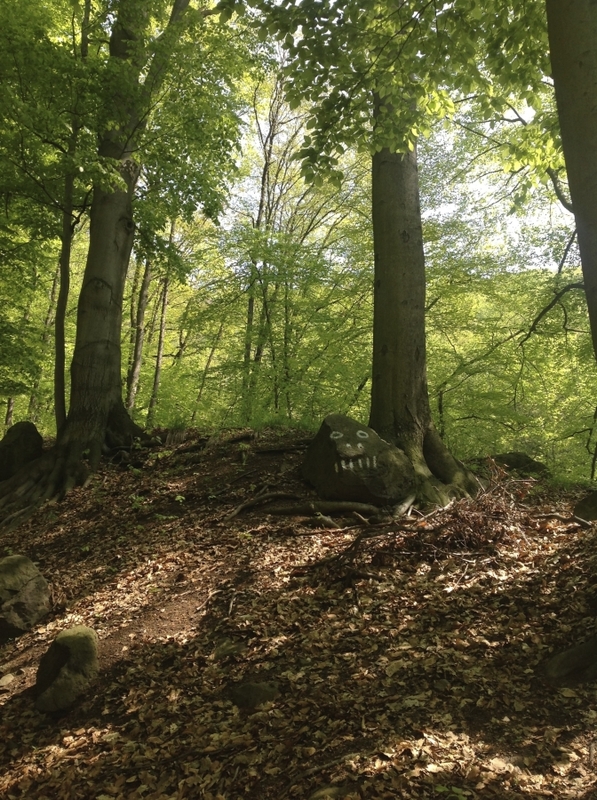 Almost every scene location was found somewhere along the way, and everything I spotted I tried to include, whether it be a cattle shed that Owen sleeps in, apple orchards and rivers, or chopped down trees like a crop of seats, or even a boulder half hidden in a forest with a white painted face. 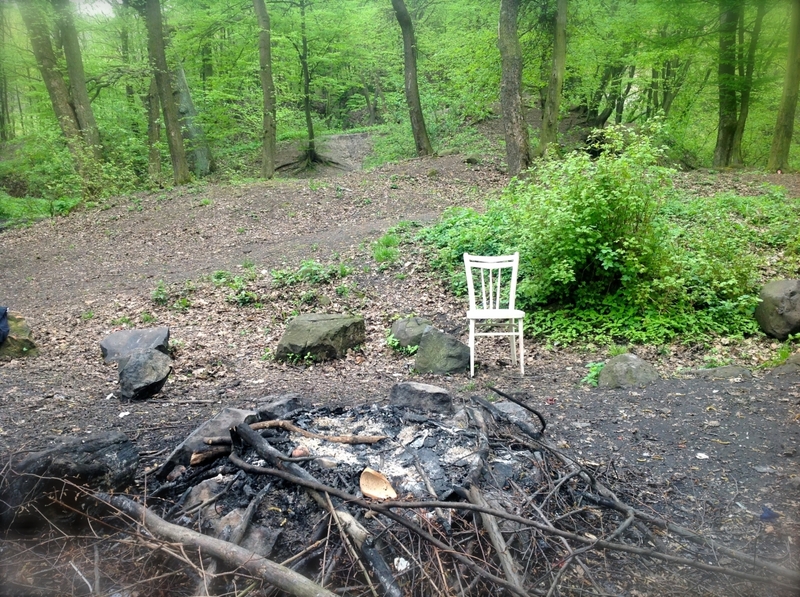 On a hillside near Ústí nad Labem I came across a woodland pool with a small waterfall, an abandoned fire and even a painted chair that somehow had been hauled up and down the densely wooded slopes. There was such a strange otherworldliness to the dell that an idea for a scene instantly came to me, and the key points were drafted sitting on that very chair. 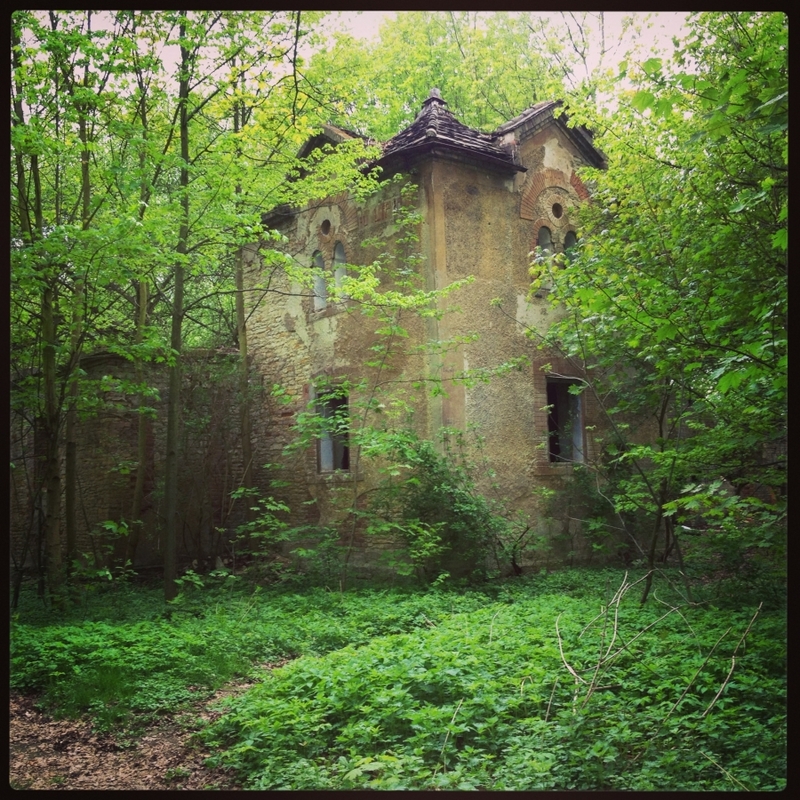 Another discovery was an abandoned house on the edge of a river, with a tiny boat moored outside. I stumbled around the outside for a while, pushing through the saplings, and then clambered in, scrambling over the brick rubble and kicking around the debris. Most of another key scene was devised in there. The descriptions used are exactly as I had seen them, right down to the rusty fork and a man’s muddy unlaced shoe. A few days in to the trek however I realised that the journey was not just about the landscape, location-hunting, and brainstorming scenes. It was also about the mental challenges that a journey like this makes on you. I could have sat at home and imagined Owen’s tiredness, perhaps the ache of his feet, but it’s not the same as actually feeling it. As the days went by I also found it increasingly hard to keep my mind focused and it kept wandering, as Owen’s does. Although two companions eventually join him there is little communication, and the further I travelled, too, the more insular I became. I felt as if I was folding in on myself, sliding deeper and deeper into my own thoughts. I realised how easily Owen’s mind might drift, sometimes gone for many minutes at a time, how he would find himself falling through memories like trapdoors, and how walking for days on end without conversation soon becomes trancelike. All of this found its way into the novel and only when I arrived in Leipzig, did I, like Owen, feel like I was finally resurfacing from a dream. Journey’s end for me, although not Owen, was Hamburg. 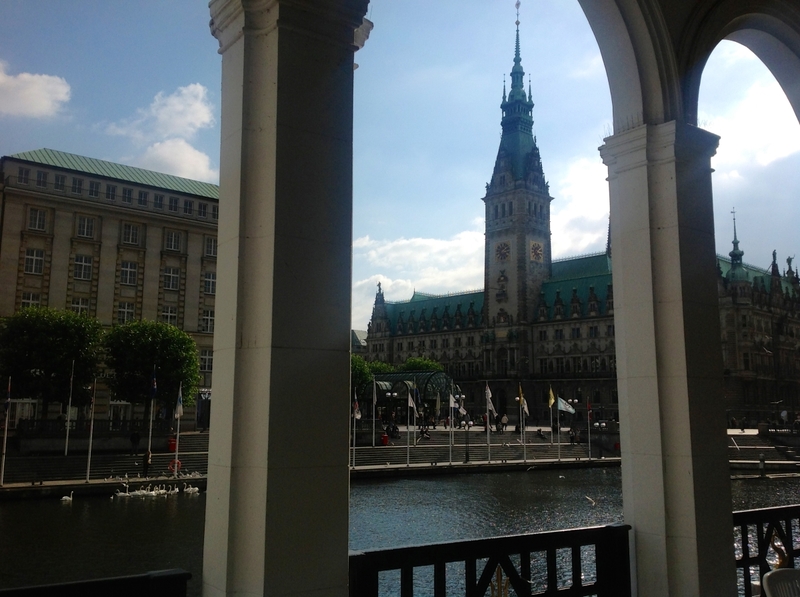 I sat in the Alsterarkaden as he does in the novel, and wrote one of the penultimate scenes, looking out across the water to City Hall, that in May 1945 would have had English tanks outside. I felt a sense of satisfaction; my notebook was full, my story plotted. Now sometimes I wonder if without the trip the novel would have ever been written. 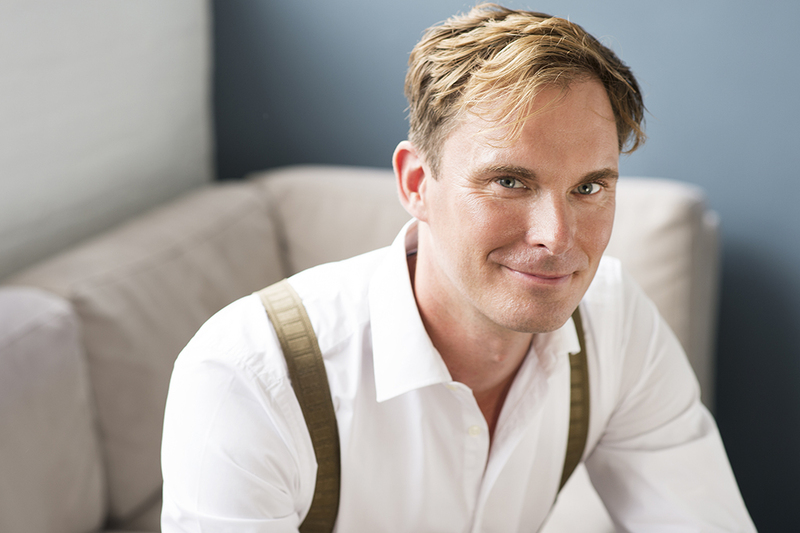 So much of it would be missing, least of all Owen, for somewhere along that journey we connected – he and I had merged into one. Thank you to Jason for this evocative insight into every aspect of the creative process behind the book. 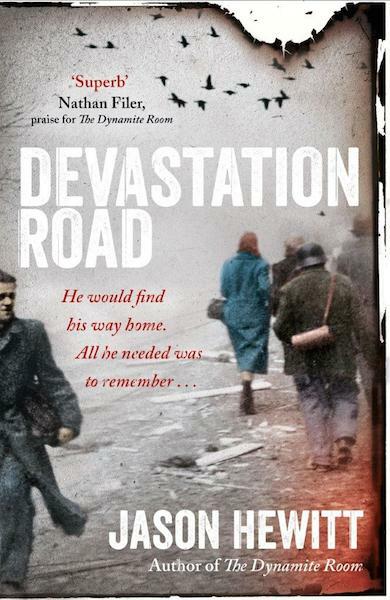 I am always struck by the number of novels set during/around World War Two – that makes it ever harder to find a fresh take but the publication of Devastation Road confirms that Jason Hewitt has done it twice. Owen is a character in whom the past and present are interwoven to great effect, playing with the fragility of memory (another popular theme done differently here). The writing has an immersive emotional and sensory quality that captures both beauty and horror; this is a heart-rending story with moments of tenderness and light amid the darkest suffering, desperation and brutality – some of which I cannot get out of my mind. I didn’t finish all of my Summer Holiday TBR List whilst I was in France but I have now and next week I’ll be posting a round-up of my summer reading, with thoughts on those eight titles and others that deserve a mention. Thanks to those still consulting and sharing my Summer Reads 2015 – it’s lovely to hear that many readers found something they enjoyed. Wow, such a fab interview! It is so interesting to hear the story behind a book, especially how a writer connects with the location. Fascinating. Thank you! Fascinating interview-now to get the book! Fab interview and some lovely photos. I also read his other post about Narvik, which I somehow missed the first time round . My Dad was one of the last British troops out of Norway in WW2. Will need to add to my long TBR list!